Our FBD campaign is over and arguably it’s just as well, seeing as we’ve a fairly hefty list of injured and unavailable players as we head into the start of this year’s National Football League. Our 2016 NFL Division One campaign starts for us on Sunday week (January 31st) down at Páirc Uí Rinn against Cork (throw-in 2pm). Last Sunday’s match was particularly expensive for us injury-wise as it looks to have robbed us of three players who most likely would have started against Cork. The Mayo News reports today (paper and digital versions) that Keith Higgins, Kevin Keane and Conor Loftus are all likely to miss out on the Cork match. Keith and Kevin are due to have scans on their respective knee and shoulder problems while Conor’s problem is hamstring-related. With so many players already out through injury or club commitments, this means that the fit-and-ready-for-action cohort is a bit on the low side. 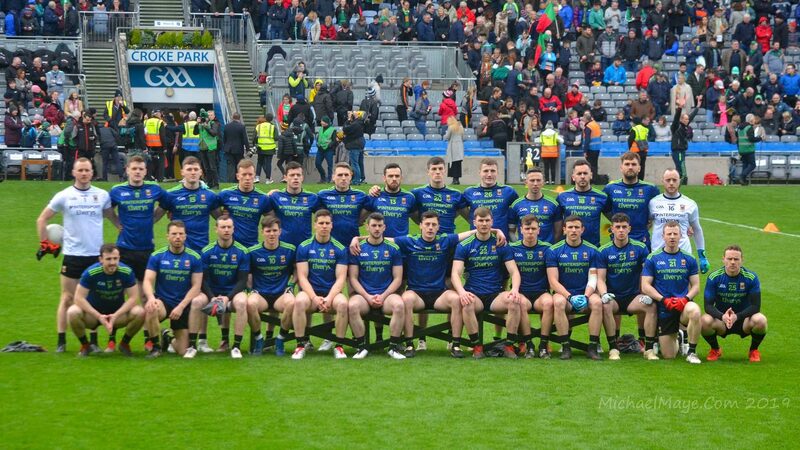 The Mayo News has done a count and reckons that only around twenty lads will be okay to train this week, which isn’t exactly where you want to be as the serious action starts to loom into view. The major lesson I took away from last Sunday’s game was how youth, experience and – crucially – size need to be mixed carefully if you want to maintain competitiveness. We were, for example, very lightweight in the forwards the last day – only Jason Doherty was able to do anything with the direct, early ball being pumped in – so we definitely need to alter the balance there for Páirc Uí Rinn. The good news, however, is that we should be able to do this. Diarmuid O’Connor returned to the fray off the bench at MacHale Park and Alan Freeman (who was away on a well-deserved holiday) will be available for selection too. Stephen Rochford last week expressed the hope that Aidan O’Shea would also be fit so if that three, as well as Doc, are okay to line out we should be okay in the forwards for Cork. This is bearing in mind that Kevin McLoughlin (who always seems to play well against the Rebels) should also be back and the likes of Mark Ronaldson, Keith Ruttledge, Darren McHale, Conor O’Shea and Brian Reape will also be in the mix. Heck, Evan Regan might even be available too. Tom Parsons and Jason Gibbons look set to man the engine room and, if they do, that’s a strong pairing. Both of them impressed in pre-season – I thought the pair of them were excellent on Sunday and we should have no worries whatsoever heading into battle with that duo in the middle of the field. The likely loss of Keith and Kevin at the back is undoubtedly a blow but in Keith’s case it’s no harm that he gets a rest, though admittedly you’d prefer that it wasn’t an enforced one. His absence will, however, force us to look at other options at corner-back and as one who thinks that the Ballyhaunis man should be deployed somewhere else this year then I believe it’s no harm we’re getting to road-test those options now. If it were me, I’d tip young O’Hora in at 4 the next day and see how he handles it. With Brendan Harrison, Ger Cafferkey, Shane McHale and David Kenny also available we have plenty of other options in the full-back line. In the half-backs, James Horan’s preferred Keegan/Vaughan/Boyle line-up is available, with Caolan Crowe, Shane Nally and, possibly, Stephen Coen (depending on how Holly-Carra get on this weekend) ready for action in this area too. Between the sticks we have Robbie Hennelly and Matthew Flanagan so no worries there. All in all, despite the large number of players who aren’t available right now, there’s no reason we can’t put out a strong side against Cork. While some of the experimentation that Stephen Rochford and his selectors will be doing is sure to be of the enforced variety, it also opens the door for others to take full advantage of the opportunity they’re being handed. The more lads that are able to come into the side in this early part of the year and do this, the better. Would David Kenny be ready for a shot in the league against Cork? He looks like a player with serious potential in the corner back position, although it might be a little bit too soon for him yet. It’s impossible to judge what level players are at from FBD games. Early rounds of the League are on wet damp pitches. And in such circumstances (like in FBD) size matters. Real speedsters usually can find the going tough as the matches drag on. What about Seamus Cunniffe, Conor O’Shea and/or Adam Gallagher? Are they available? Surely we have enough personnel based on the level the overall team operate at (and even with injuries) to put out a reasonably strong group. Something along the lines of the following to be picked from? After all max we can bring on is 5/6 subs on any day. In order to have balance in the team and maintain a chance of winning there Cannot be any more than 4 new guys. One of Ohara/kenny/Harrison in FB line, hopefully Nally in HB line, possibly Ronaldson and Ruttledge in forwards. Any more than that and things could go pear shaped early on and you don’t really find out if these new guys can cut it. Thanks Willie Joe – just checked out that original panel update by the County Board on 7th January or so where it listed the injured and unavailable. The ‘unavailables’ at that time now seems to be back: Vaughan, Freezer, and Keegan. The college committed trio of Conor O’Shea, Evan Regan, and Diarmaid O’Connor should now be free; the former two seemed to be flying in the FBD/McKenna and we know Diarmuid. I’ve liked the look of Conor O’Shea anytime I’ve seen him and Evan Regan should really be ready for action; I think he’s bulked up a fair bit so he should be able to win ball. And don’t forget Mikey Sweeney, even if he is on the lighter side, as you adverted to earlier about Sunday’s brigade. Sent off that last piece before I saw the interview with Stephen R in the Mayo News. Glad to say it mostly confirms what I said!! It also reports that James Stretton (I was going to include him as available) is out for 3 months with a shoulder injury. Get the feeling that caution is guiding a lot of the approach, with physios probably insisting that rest and recovery are top priority at the moment, anticipating harder battles later on. Heard last night that the Cork v Mayo game is being shown live on TG4, followed by a deferred showing of Roscommon v Monaghan. Can anyone confirm this to be the case? I’m genuinely surprised Gareth O’Donnell hasn’t been called up yet. Played midfield on the U21’s two years ago with Conor O’Shea and played minor for the county also. He’s over six foot, strong and can play in the half backs/forwards or middle. Edwin McGreal tipped him for a possible call up in the Mayo News a few weeks ago. I think the enforced break for Higgins might be no harm at all, provided of course the injury itself is not serious. He has a colossal amount of football under his belt over the last ten years and a rest could do him the world of good. It’s certainly a chance for a few of the newer members of the panel to stake a claim. We may well have to throw a few more than normal in this year and that might leave us vulnerable in terms of accumulating points to sustain our divisional status. The team more of less picks itself for the cork game and THB I think it’s a strong enough team to beat Cork. I wasn’t at the game on Sunday but I heard Keith’s injury looked quite nasty. Is there any chance it is “season threatening”, as alluded to by Stephen rochford. There seems to be a presumption here that he will recover and be back quite soon. Is that the case? I would never be happy to throw in the towel on our Div 1 status before a ball is kicked in anger. Yea we could go down any year, but equally we could succeed. In the last few years any one of 6 or 7 counties could have gone down, and somehow we prevail. I place a lot of faith on Mayo football, and Div 1 is where we belong. If we need points towards the end of the league let the other counties worry about Mayo. I am not saying Ronaldson is the solution but we need a playmaker there. I’d love to see Cillian at CHF .pretty sure he played that position v Galway in 13 and horan had a plan of sorts for him but he was injured for Ross game after and just slotted into ff line for London game after that . He has playmaker written all over him imo. It is interesting to see new players being tried, and with injuries to the panel, we will be heading into the league with a lot of change in personnel, however, the most important thing to get right in my opinion is a system of defending where we don’t concede goals.This has been our Achilles heel for the last number of years and has cost us dearly. The league is the time to put this in place not introducing a new sweeper in the All Ireland Quarter Final as was done last year. Dublin used the league for this purpose last year and it paid dividends for them. They were rock solid in the championship. Throwing new lads like O’Hora or Nally into the fray without a solid shape in the back would be disastrous. We will have the players to win Sam if organization at the back is a great deal better than heretofore. We have great, big strong men in the centre spine that other counties would envy. We will get plenty of possession. Converting it into scores was not our problem last year. Letting in goals was. I am worried about full back. Is there anybody new putting up his hand there? Pity Keane is injured. He was great in the league there last year but hardly used in the championship. It is a vital position, particularly in relation to the high ball into the square. I wonder how Dublin will get on without Carroll this year. I always felt he was vital for them. It is crucial to get this position right. Tickets came in the post today for the Cork game. Hotel booked for Saturday night. All set. Looking foward to it now. Firstly I hope the injuries suffered last weekend are minor, two great players and in particular Higgins who is simply a joy to watch with his vision and remarkable agility, a class act. Just wondering if someone could suggest a good hotel that is reasonably priced for the Kerry Mayo game on March 13, thanks. Evan Regan was eligible to play last weekend I know people queried why he wasn’t. He picked up an injury that ruled him out. Good luck RosTown!Give it your best, your very best like Carthalan and may your visit among De Boys,De Langers,De Gobdaws and De Fiens be fruitful and memorable! Try the Harlequin….nice place… near pitch. Inbetweener, thanks for the heads up I appreciate it. Good luck against Cork in your opening round. Opening games are a little difficult to judge with fellas still smelling of factor 30 and they trying to rid the temple of beer, cranberry sauce and all the trimmings !! It won’t be long before we smell cut grass and the games begin to quicken the heart, there is nothing quiet like it. 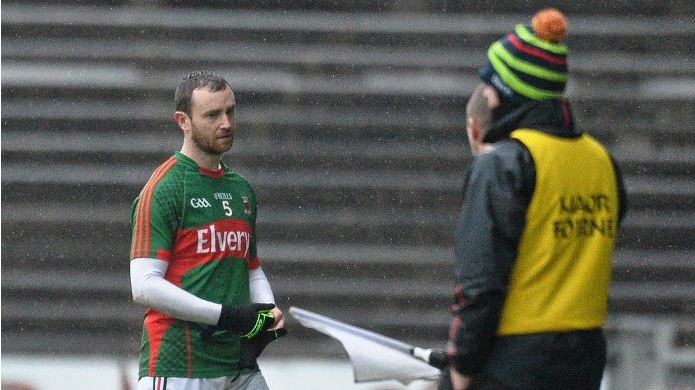 Mayo expect to know later today the full extent of the damage to Keith Higgins’ knee injury which forced him out of Sunday’s Connacht League loss to Roscommon. Higgins was scheduled to have a scan after his early departure but the initial prognosis is that the injury is not too serious and he should back within four weeks. Kevin Keane, who damaged a shoulder in the same game, may take a little longer to recover. Keith had a small ligament injury to the knee about seven years ago. He landed awkardly coming down catching a ball. Had to come off and missed six weeks. It was the last time I seen him injured in a game. Actually himself and McGloughlin are so agile you never see them take hits or stumble. I too would like to see Cillian at CHF. I think he has the perfect attributes for the position in he has strength, two great feet and most importantly vision to pick out the correct pass and open a defense. Up She Flew says: Some good points there. Our defending improved last in the first semi final and against Donegal but we reverted to kind in the replay. A work in progress perhaps. Makes sense to keep Cillian away from tight battles in the full forward line. Kevin Mc and Cillian are both able to drill accurate quick ball to the full forward line. Kevin Mc is a great tackler and good on breaks. Diarmuid then is good at getting up and down his wing and he rarely loses the ball. Have a bit of scoring distance then with Cillian and Diarmuid. Kevin Mc brings pace. Cillian and Diarmuid size. Nicely balanced line I think. It’ll be very interesting to see what kind of a team Mayo U21s will have for this game. Best of luck to them! It’s looking like a v promising time ahead with that half forward line of Mc Oc and Oc. Does that put AOS at ff and Regan in the corner with Kirby/ Doh//Loftus //Rutledge lining up for the other corner? Jeeeez!! Well personally I would play AOS a full 30 yards from goal and more to the right. – He avoids the tightness to the endline/square and goalkeeper. – Teams will be well prepped for the standard approach of AOS in the square and runners coming on the loop. It might have worked last year (runners on the loop off of AOS) it will be bullet point no. 1 in the plans of how to stop our attack this year if we go with it. In behind in the corners there are many options. I would have full confidence we’ll have a very good forward line this year and subs as well. Remember a guy like Neil Douglas is getting goals every game he plays and is leading the line there for Castlebar. You have Duffy, Irwin and Reape at U21. You have Regan, Rutledge and Loftus. Loftus also being U21 of course lets not forget. Only 3 home games this years league how’s that agree with comments over cillian at centre forward. Any word on Higgins’ injury? To be fair to ronnie he has done ok at chf in fbd and its nice piece of experimenting and thats what we want. Stiffer tasks lie ahead with more intensity and less space to operate. K mac plays very well this time of year. he would be very good chf as he is quick, can cover ground and pass the ball well. A number of those guys can also play in different positions and if Hollymount lose on sunday [ which i hope they dont] we could have a few of those guys available. What do ye think of that panel i picked guys? Nice panel, toughnup. You’re hired! All panels picked at the moment have unavoidably a great similarity about them,such is the pool of players available.In fact you might call it a puddle!! Toughnup,I have a strong feeling that R is not happy at chf. I think he finds it so difficult to cut loose when he gains possession that other peoples where abouts would nt be of prime enough concern to him. K Mc would be quite the opposite… more than anyone on the team.Then there’s COC and AOS and JG.There are a no of options of who should be where and the optimum placings will be those that give us the best understanding and integration between the players for to do what they need to do. Cork play this weekend so hopefully they’ll be tired and be less a few as well.